In this series of posts, we sit down with a few of the keynote speakers of the 231st AAS meeting to learn more about them and their research. You can see a full schedule of their talks here! In 1965, the landscape of astronomy looked nothing like what we know today. Penzias and Wilson had just discovered the Cosmic Microwave Background, humans hadn’t yet set foot on the moon, all sorts of discoveries—pulsars, exoplanets, the acceleration of the expanding universe—were waiting to be made… and graduate student Eric Becklin had just started studying infrared astronomy. Prof. Eric Becklin is now a professor emeritus at the University of California Los Angeles. 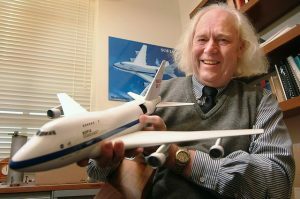 He has been awarded the AAS’s 2017 Henry Norris Russell Lectureship in recognition of his “lifetime of eminence in astronomical research,” and he will give a plenary lecture on his illustrious career in infrared astronomy. Becklin actually started out as a physics student, one who “really didn’t have any interest in astronomy.” He went to graduate school for physics, but he quickly decided he wasn’t “going to do high energy physics or [quantum] field theory or anything like that,” and started taking astronomy courses instead. The Two-Micron Sky Survey (TMSS) was one of the first large-area near-infrared surveys. While working on TMSS, Becklin discovered an infrared source in the Orion Nebula. This object, one of the reddest known sources with no optical counterpart, is now called the “Becklin-Neugebauer object” (Figure 2). Becklin also discovered that he “enjoyed [infrared astronomy] tremendously,” and he has stayed in the subfield ever since. Throughout his career, Becklin has dealt with all kinds of infrared detectors, including ground-based telescopes (e.g., the Keck telescopes on Mauna Kea in Hawai’i) and space telescopes (e.g., the Spitzer Space Telescope), but today he is perhaps most well-known for his work in airborne infrared observatories. These detectors fly on balloons or airplanes at high altitudes, avoiding cloud cover and infrared-absorbing water vapor. 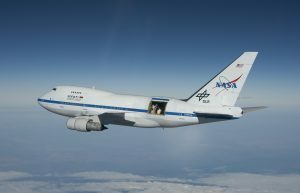 In particular, Becklin was instrumental in the development of the Stratospheric Observatory for Infrared Astronomy (SOFIA; Figure 3). Becklin now serves as the senior science advisor for SOFIA, advising the director and staff about SOFIA’s science goals. Becklin’s main current scientific interest is the Galactic center. SOFIA has been able to measure radiation from dust and gas around the black hole at the center of the Milky Way, and Becklin will talk more about these observations during his lecture. Furthermore, he will also discuss our understanding of the Galactic nucleus in the context of observations of the centers of other galaxies. 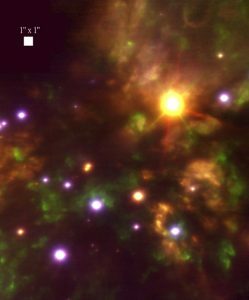 If you’re interested in learning more about these results or about Prof. Becklin’s illustrious career, check out his talk, “Fifty-four Years of Adventures in Infrared Astronomy,” at 4:30 PM on Thursday, 11th January at #AAS231! I'm a grad student at Caltech, where I study the chemical composition of stars in nearby dwarf galaxies. Before coming to sunny California, I spent a year as a postgrad at the University of Cambridge, studying star formation in galaxies. Now that I've escaped to warmer climates, my hobbies include rock climbing and finding free food on campus.